The Schlage Accent Lever Keyed Entry Lock in Matte Black unlocks when the door is opened from the inside, allowing you to leave quickly and conveniently, and re-enter easily. The Accent Lever is widely popular for its elegant wave-like design that effortlessly matches a room's style without overshadowing it, and looks especially elegant when finished in Matte Black. Plus, it's been designed and tested with strength and durability in mind. 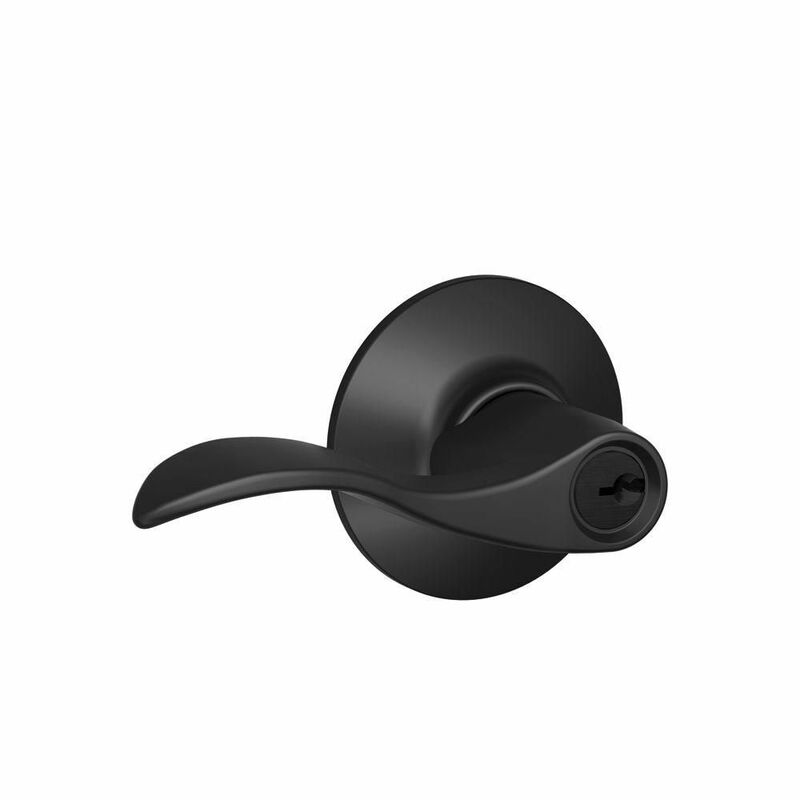 Accent Matte Black Keyed Entry Lever The Schlage Accent Lever Keyed Entry Lock in Matte Black unlocks when the door is opened from the inside, allowing you to leave quickly and conveniently, and re-enter easily. The Accent Lever is widely popular for its elegant wave-like design that effortlessly matches a room's style without overshadowing it, and looks especially elegant when finished in Matte Black. Plus, it's been designed and tested with strength and durability in mind. Accent Matte Black Keyed Entry Lever is rated 4.3 out of 5 by 4. Rated 5 out of 5 by Alex from Heavy solid handles that look great. Easy installation. ... Heavy solid handles that look great. Easy installation. Rated 4 out of 5 by SM from I ordered three of these in the same order and was expecting them to be all keyed the same but th... I ordered three of these in the same order and was expecting them to be all keyed the same but they were not. In a previous review I had read, someone had this happen so I thought it would for me too. But it was not to be so now I have to re key two of them. I'm not sure how you can stipulate this option with your online order but just worth mentioning if you were thinking about doing similar. Apart from that very pleased with my purchase. Rated 3 out of 5 by Bill from It didn't work with my 5" backseat. Had to go with a Baldwin lever and a Kwikset 5" backseat. It didn't work with my 5" backseat. Had to go with a Baldwin lever and a Kwikset 5" backseat. Rated 5 out of 5 by Dragon from I purchased two locks. this one and a deadbolt also in matte black. They match my new security do... I purchased two locks. this one and a deadbolt also in matte black. They match my new security door perfectly! Glad I ordered them.